This woman had presented with hemoptysis once and a CT scan showed tree in bud pattern and some nodularity. She presented a year later with cough and sputum. A culture had previously shown 1/3 AFB + but non-TB and non-avium. Her symptoms are the daily cough without constitutional symptoms and no shortness of breath. I sent off a sputum and it showed Many PMNs, few Epithelial cells, many Gram positive cocci in pairs, chains and clusters and rare Gram negative bacilli. 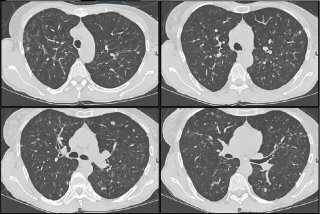 I'm sure most of us have seen some close variation on this clinical theme: a smoker has a suspicious lung mass with evidence of metastasis elsewhere, and you're consulted to help get tissue. The patient hasn't seen the scans, doesn't know the overwhelming odds that they have metastatic lung cancer. As a consultant, how much should you tell the patient before you have path results? If they ask about the possibility of surgical resection, is it right to put off an answer you know is highly likely to be correct? 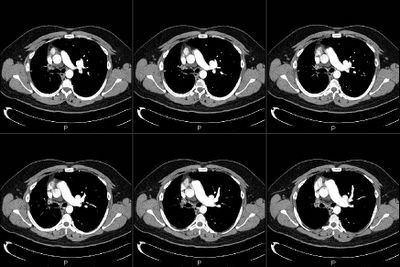 The International Early Lung Cancer Action Program Investigators published the results from CT screening >30,000 patients with chest CTs in today's NEJM. They found a shift towards picking up more early stage disease. Have you had a chance to see the study? How do you think this will affect our practice? How do you make a determination to treat for GER in patients with asthma? Littner MR, Leung FW, Ballard ED 2nd, Huang B, Samra NK; Lansoprazole Asthma Study Group. Effects of 24 weeks of lansoprazole therapy on asthma symptoms, exacerbations, quality of life, and pulmonary function in adult asthmatic patients with acid reflux symptoms. 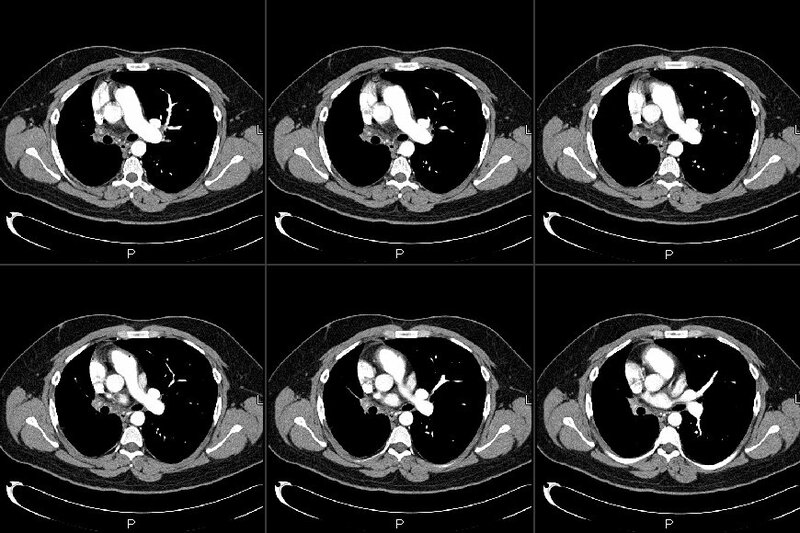 Would you do anything for secondary pulmonary hypertension (estimated PAP of 80-90 mmHG on echo) due to COPD before undergoing renal transplant? Her COPD is 2 to AAT deficiency and stable on AAT replacement. FEV1 of 40% predicted. She has documented nocturnal desat on sleep study without significant sleep apnea. But she is non-compliant with home O2. Daytime sat on RA is OK. She is not a smoker. She is on dialysis and her ESRD is due to pauci-immune vasculitis and has been treated with steroids and Cellcept. Work up for other causes of secondary pulmonary HTN is negative. 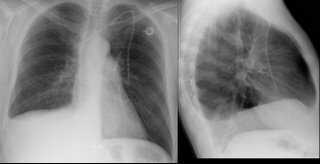 41 yo male who works for a satellite dish installation company presented with progressive dyspnea over a couple of months. 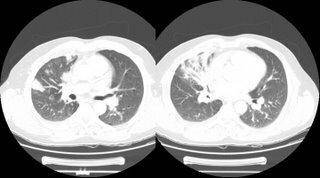 An urgent care CXR was (+) for a nodule in the R mid lung field, and he was referred to his PCP; he received no intervention at that time. He was lost to f/u and ultimately presented with progressive symptoms one month later. His PCP obtained a CT (see below) and he was sent to be admitted. Upon seeing him, he look chronically ill, but not toxic. I bronched him, and it was non-diagnostic. I sent him for a surgical biopsy. 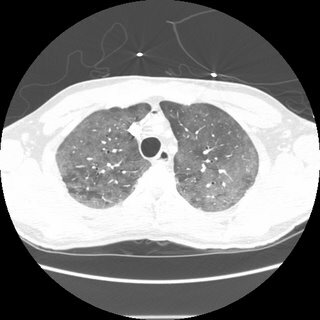 The report was read as BOOP with an microscopic sulfur granules c/w actinomycosis. I started him on Augmentin and saw in the office in 3 weeks. He was no better. Spiro was c/w were moderate restrictive vent defect. So, I started him on steroids at 40 mg/day of prednisone x 3 weeks then 30 mg/day. I saw him 4 weeks later (about 1 week into his 30 mg/day) without any clinical improvement. His full PFT's are c/w mild obstruction with air trapping and impaired gas exchange (DL ~70% predicted). He is a smoker, and is still smoking about 1/2 ppd. I had his biopsy reviewed by Jeff Myers at U of M (profoundly smart and helpful- wish he would have joined the faculty 5 years sooner), but he thought the original interp was correct. tree in bud in a 66 year old. of the right middle lobe. 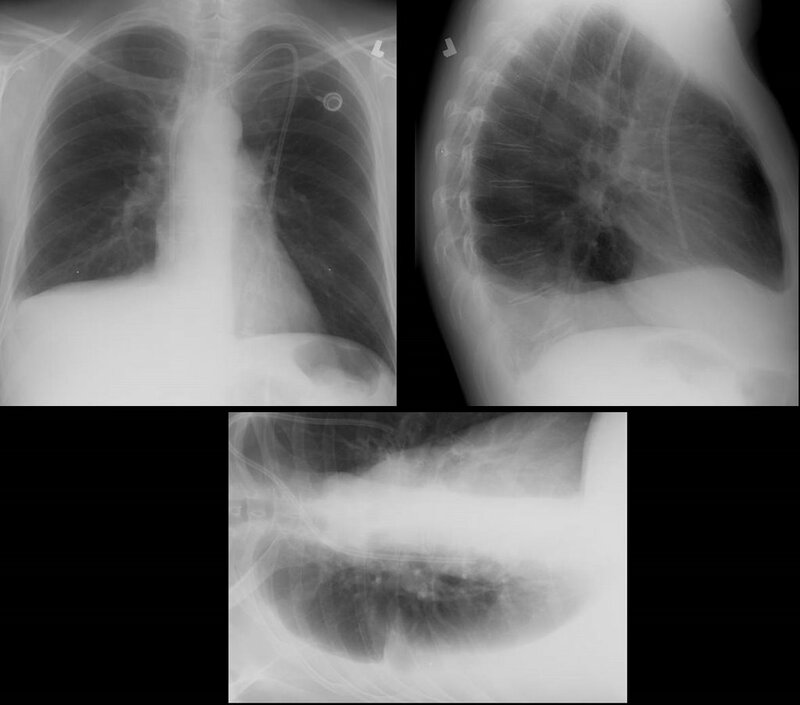 In terms of management, how would you proceed, given the slight worsenening radiographically? Follow-up to "What is wrong with this picture?" Get some feedback from others: Submit a case! If there are too many details (i.e. time consuming), feel free to submit a brief one and people can ask for clarifications in the comments. I usually don't like those boards-type question that ask "what would you do next?" and only let you choose one option since we often do more than one thing in real life. Having said that, I am curious as to what you would do next in this case. This is kind of a VIP patient so she was referred to a couple different specialists at the same time. 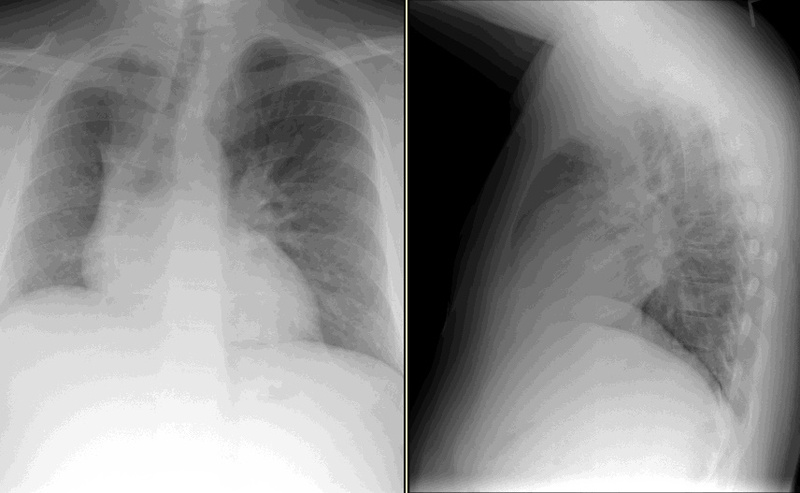 She is in her early 70s, quit smoking in 1972, near normal PFTs (FEV1~70%, normal DLCO) and has an abnormal CxR. 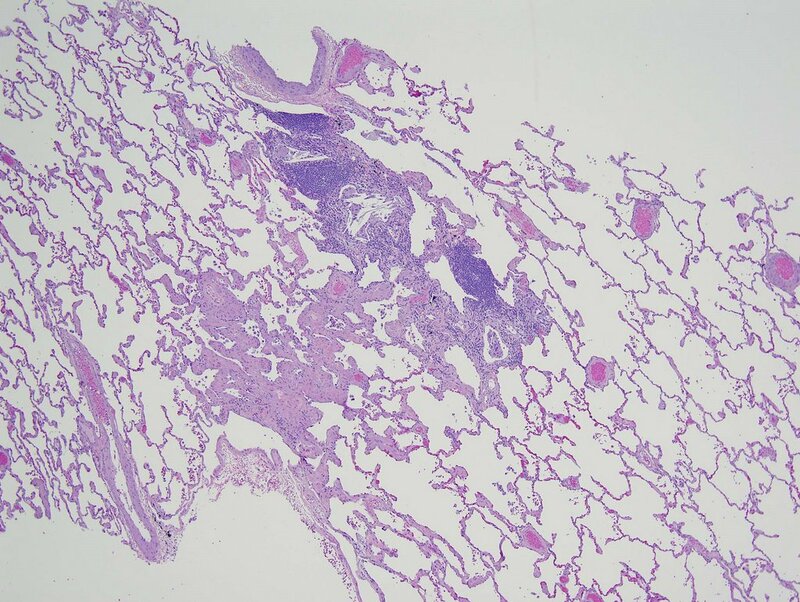 It started as an URI and then she developed a "deeper" cough with purulent sputum production and some pleuritic CP. 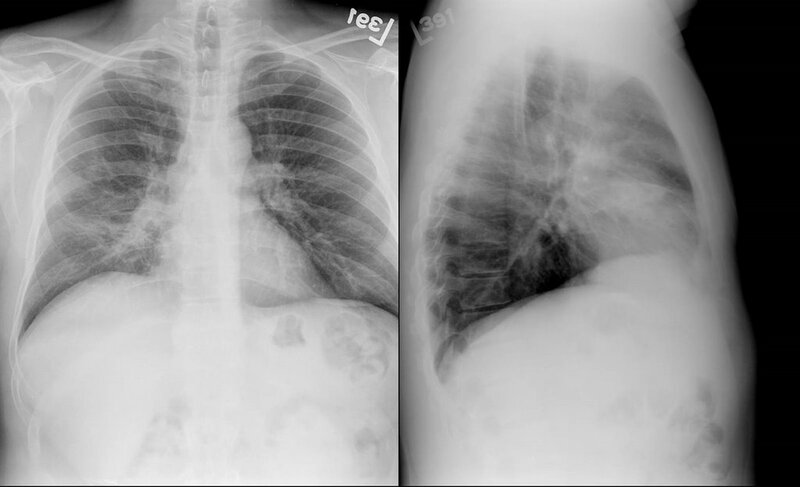 The abnormal CxR (and some CT cuts) are shown below. 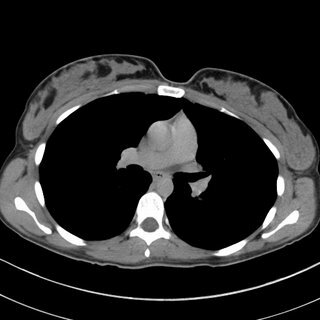 She had no adenopathy on the CT.
79-year-old man who underwent a four-vessel CABG in January 2006. 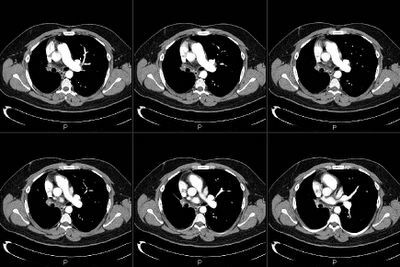 A few months prior to that, he had developed some malaise and ultimately chest pain leading to an angiogram that revealed 95%, 90%, 80%, and 60% occlusion. After the 4-vessel CABG, he reports shortness of breath worse in the supine position that occurs quite quickly after lying down, perhaps after a minute. He is able to walk a few miles without significant shortness of breath. He is also able to walk up a flight of stairs with only moderate shortness of breath, and he denies any muscle weakness or achiness. He is able to stand from the sitting position in the chair with a bit of shortness of breath, but no frank weakness. The patient denies any fevers, chills, or night sweats. Furthermore, he denies a cough. There is no productive cough except for the occasional cold about once a year. Rest of his complete review of systems is noncontributory. On exam it is unremarkable with good air entry bilaterally. In the supine position there is bilateral paradoxical abdominal movement with inspiration. It appears he has bilateral diaphragmatic paralysis. It coincides with the CABG, but I think this would be fairly atypical, as that is usually associated with unilateral. In terms of muscle weakness, the low PI but normal PE max argues against this. 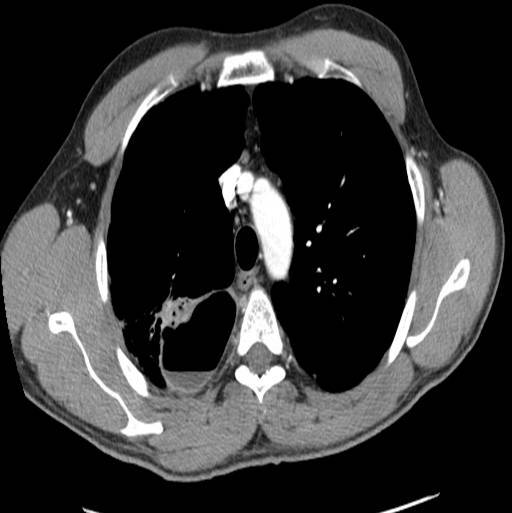 This 26 y/o man with a history of smoking 1 ppd cae to the ER with cough and new hemoptysis. This is a 38 year old man who is 1.5 years s/p a bone marrow transplant for non-Hodgekin's Lymphoma that had relapsed despite several chemotherapeutic regimens. His post-transplant course has been generally uneventful, with good engraftment, no major infectious complications, and minimal GVHD of the skin and gut. He also had a DVT at some point, treated with adequate anticoagulation for 9 months. 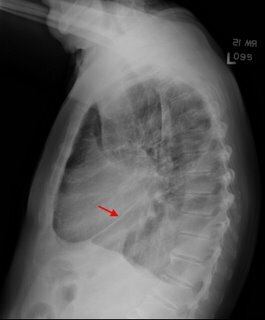 He was referred for a right pleural effusion. 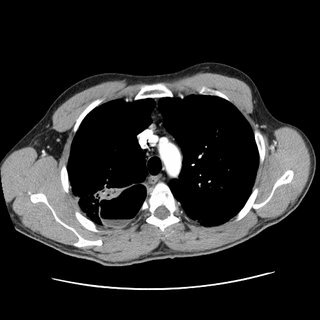 This was tapped-it was a chylothorax. Flow-cytometry was negative for a recurrence of the lymphoma. 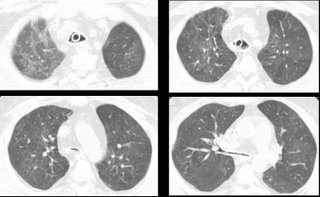 His pulmonary function varies a bit between normal and a mild obstructive ventilatory defect. His exercise capacity has continued to improve since the BMT, but remains significantly below his pre-morbid state (he was, prior to his cancer, a highly trained endurance athlete). He is referred for pleuradesis. Thoughts? How would you proceed? 45 year old man, presented with a persistant cough that did not go away despite 4 different antibiotic course, some kenalog, some anti-allergy meds, and finally a CXR that showed "Right middle lobe pneumonia"
He was admitted for the persistent cough. ROS no weight loss, SOB, nightsweats. Just the cough (non productive). SOCIAL HISTORY: married,self-employed painter. He smokes cigars usually five times a week. He averages six to 12 alcohol beverages per week. On exam the next day he was alert but confused. His vitals were normal as was his saturation on room air. He did not answer questions. He just looked at his wife and smiled. A Na was 129 when before on admission it was 137. The rest of the labs were unremarkable. LP, EEG and head CT were done but negative. By the trime some of that came back he was already becoming more oriented on his own. The next day he was a/o x 3. Any feedback before I proceed? and her pulmonary function tests were mildly restrictive (FVC ~69%), actually improved from her last testing ~ 4 years prior. I got a VQ scan that was normal, but only on her second visit (when I actually asked) did I learn that she has had 2 birds as house pets for the last 3 years. She further revealed that she has felt unwell going back about 2-1/2 years. One of the birds was in fact sick, and during this time, she fed the bird from mouth to mouth. Yes, I am serious. She was DEAD SET against getting rid of the birds, so I got a CT scan in anticipation of doing a bronch, to prove she had HP. 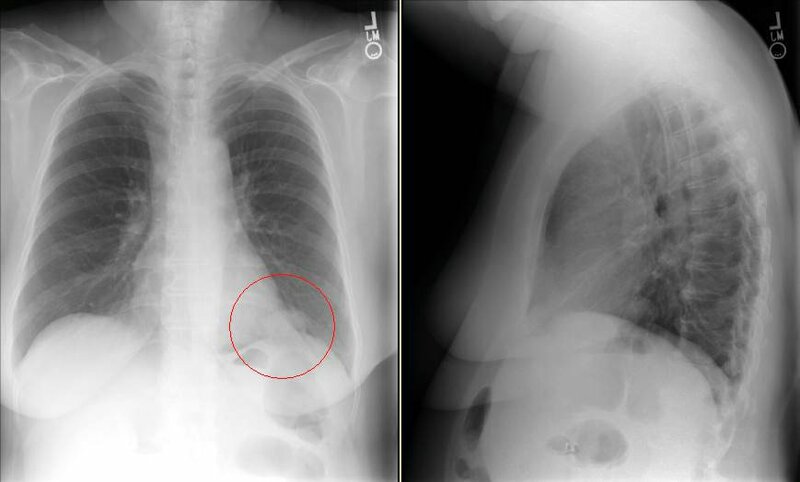 The CT showed very subtle changes of ground glass, and was actually read as no evidence of ILD, but surprise surprise, she now had a LUL mass that was not seen on the CXR taken 2 months earlier. The radiologist thought it was likely to be inflammatory. What would you do? I have more images, and some cool pictures to follow, but I’ll hold onto them until people have a chance to comment. sort commonly seen in that condition"
Have you had the chance to start patients on Chantix yet? What has your experience with it been thus far? Any good success stories? This is not a case presentation, but want to take a poll on what people are doing about steroids and sepsis. Do you administer steroids emperically after initial fluid bolus or do you attempt resuscitation per the 6hr bundle first and then administer steroids if still on pressors or hypotensive? I had posted this question but had no takers so I am posting a suggested answer. The Cleveland Clinic has an (investigational) Anti-GM-CSF autoantibody kit available for primary PAP. Check out this link for more info. 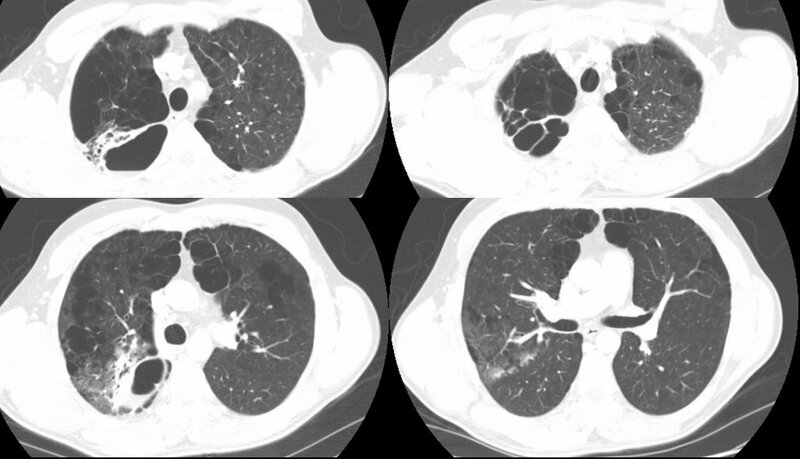 "Anonymous" sent us the following CT slices of a 38 year old who presented with cough and fever. AFB were negative x 3. He was not very productive of sputum and what they did get had many epithelial cells. How would you proceed if this was your patient? I re-bronched her focusing on the infiltrates since they had persisted for 3 months after the initial presentation. 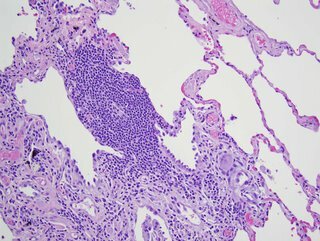 She had a lot of eosinophilic proteinaceous alveolar material and our pathologists sent the tissue to T. Colby who thought this was PAP. 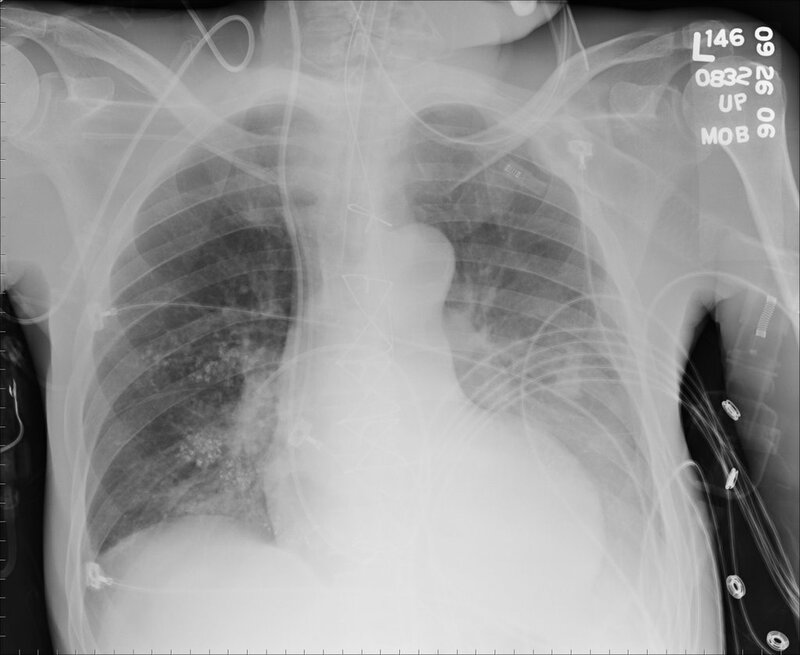 Would you be satisfied with this Dx on TBBx or would you pursue an OLBx? How about testing for anti-GM-CSF Antibodies? 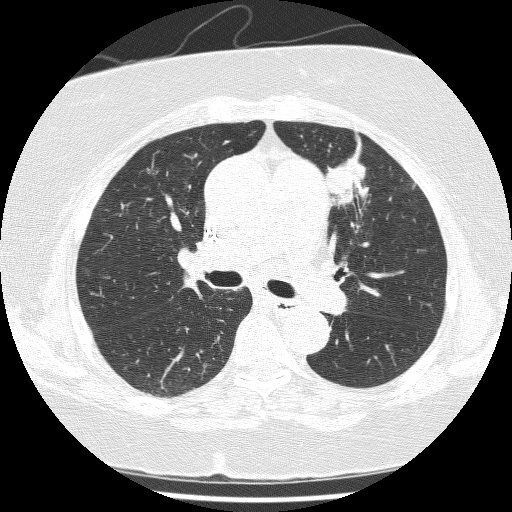 She has almost normal lung function, how would you treat her? A patient intubated and sedated for hypoxia (history of aspiration although CXR negative) had initial swan numbers of: CO 5 L, CI 3.24 PAP 26/16. PCW 8 with cvp of 4. SVR 1362. PVR is 190. AFter fluid boluses with no change in CO, PCW still 8 with a CVP of 6. His SBP has been 116/78 basically unchanged throughout. After fluid blouses he is now about 10 L up with really no change in the above swan readings or bloodpressure. How would you interpret this? Of note a surface echo showed an EF of 25-35%. Have you been checkin anti-GM-CSF antibodies for evaluation of suspected PAP? If so, is there a commercially available ELISA or have you been sending those to the Cleveland Clinic? This is the patient with the hot pulmonary nodule and lung mass. We decided to start with the thyroid and a bronch. The thyroid mass (it was not cystic on CT) was a follicular carcinoma with local invasion. No lymphnodes and the other lobe was clean. 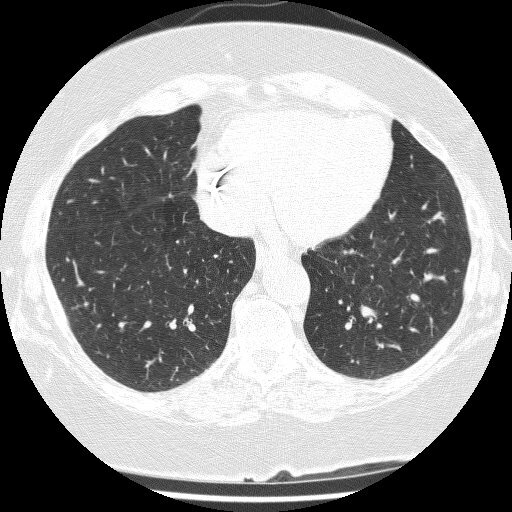 The bronch was non-diagnostic and radiology felt the mass was too low and there was too much lung in its way for a good CT-guided needle. 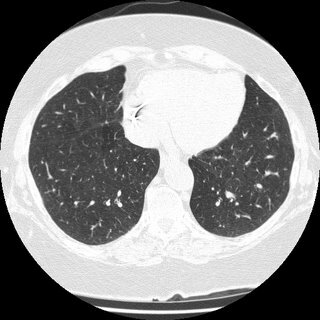 She went to see our CT surgeons and we figured out why the bronch was non-diagnostic: it was not a lung mass but a diaphragmatic mass. 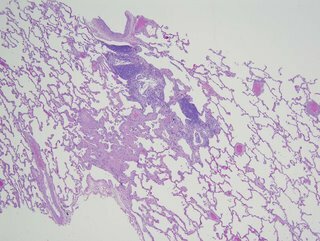 It was an aneuploid adenomatoid tumor still not clearly characterized. Incidentally, there was a second focus of this same adenomatoid tumor in the superior segment of that LLL, which had not been seen on CT or PET (at ~7mm). 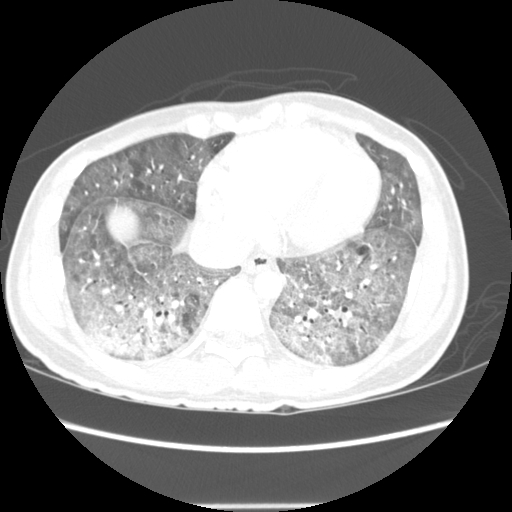 This patient has a pleural effusion. Which fissure (and which side) is this? This patient came to me pre-worked up so I will show all the data she had had thus far. 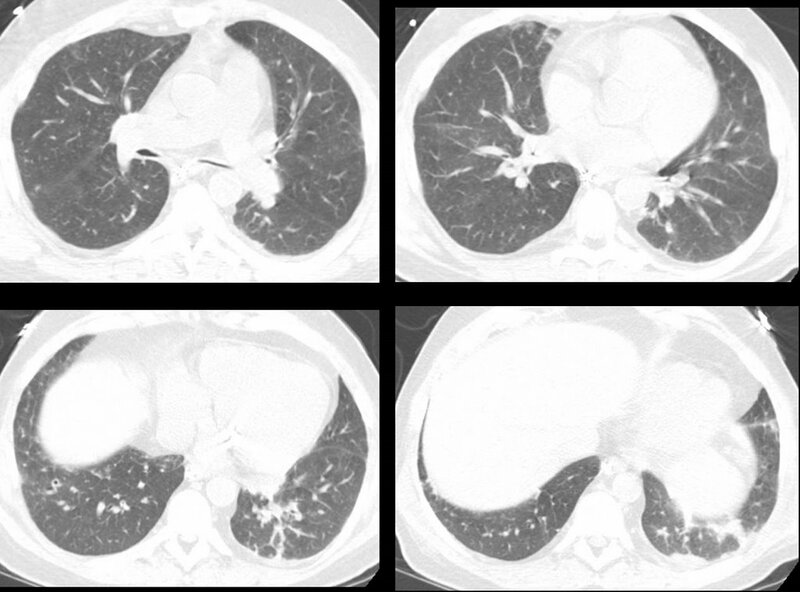 This is a 65 y/o woman with no TOB Hx, normal PFTs who had a persistent cough. She had an abnormal CxR (see above) and here PCP ordered a CT and then a PET-CT and she was sent to us. Her PET scan showed two very FDG-avid lesions. 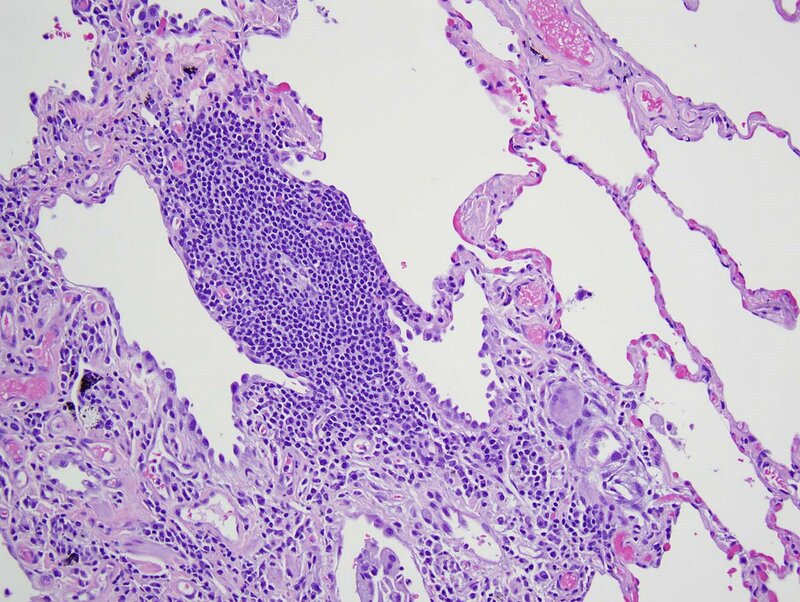 A L basilar lung lesion and a R thyroid nodule with no other abnormal uptake. She is euthyroid clinically and by TFTs. Do you think the lesion are related? Would you biopsy one, the other, both? 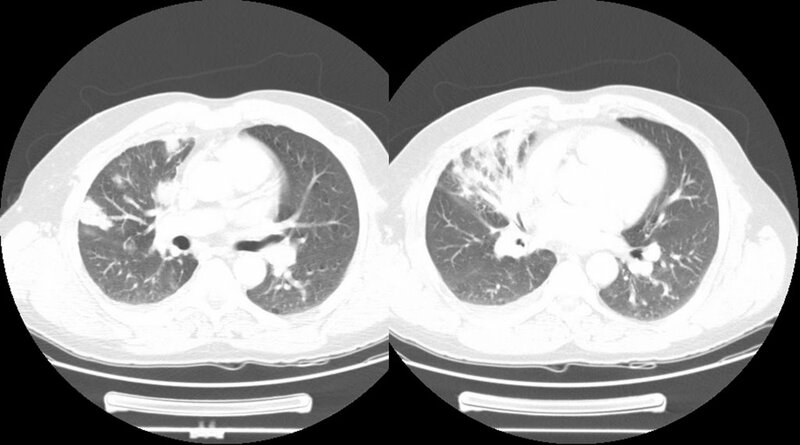 70 year old woman with COPD FEV1 34% predicted, but she is well compensated and on no supplemental oxygen (91% on RA). A LUL lesion was noted (see below) and workup included 2 bronchs (one with ultrasound-guided) and 1 CT-guided biopsy. All were negative for malignant cells. BAL was not done but Tbbx showed Atypical lymphoid cell with acute inflammation and Filamentous bacteria. BAL was not sent so we don't have micro ID (the bacteria was identified by path). Cancer is obviously still number one on the list, but I dont think she's a surgical candidate and in terms of treating with chemo, we still dont have a tissue diagnosis. On the other hand, the filamentous bacteria finding is interesting. What is your impression and what would you all do next? Thanks. 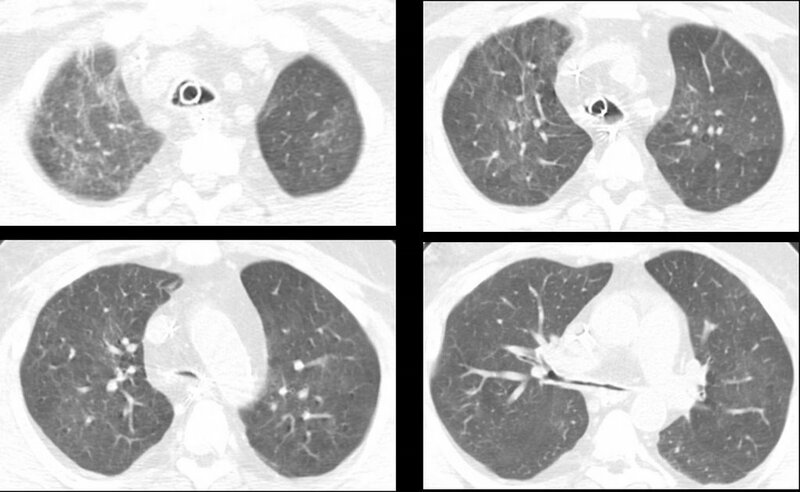 57 y/o man former smoker, presented with pleuritic CP and found to have left loculated effusion. No constitutional sx. no wt loss, fever, chills, cough. Tap 2 weeks later showed it to be bloody, with 57 WBC, 49% PMN and 49% lymphocytes. He is currently asymptomatic. The effusion was AFB - times 1. The micro and cytology was negatrive. 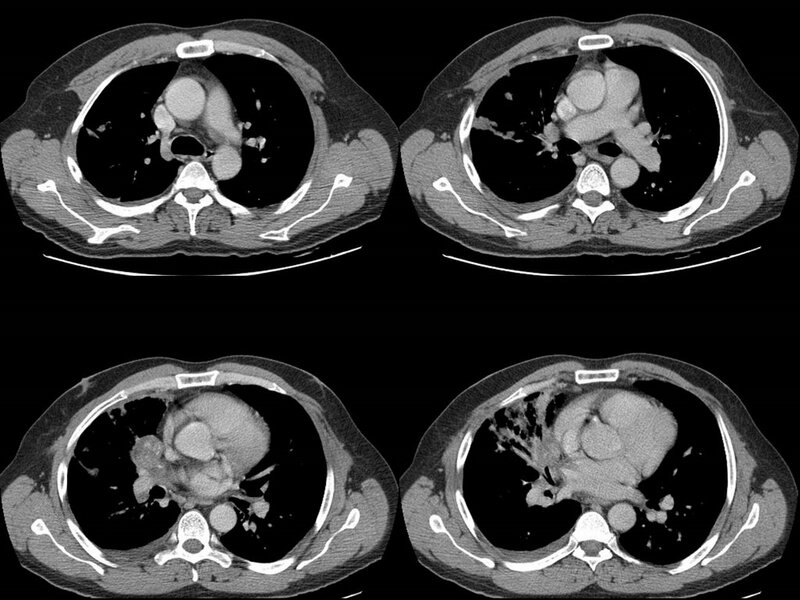 Dopplers of legs negative and V/Q was intermediate or indeterminate (cant remember) and PE-protocol CT was read as negative. His Pmhx not remarkable except for 2 previous pneumonias. Last was in march and was on the right side. There was a small parapneumonic effusion which has since resolved. No history of trauma except moving his furniture 1 day before the pleuritic CP, but he did not hit anything per se. No Fmhx of thrmbosis and in fact his Wells criteria is zero. What would you all do next? 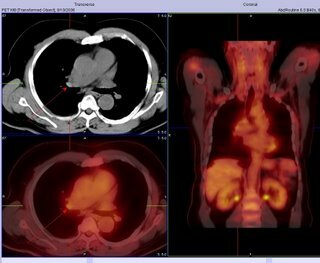 Advice on further workup for this lung cancer. The results showed no malignancy from the fine needle aspirate (but there were lymphocytes indicating that the node was sampled. Not surprisingly, biopsy of the peripheral lesion in the LUL lesion was indeed cancer - adenocarcinoma. 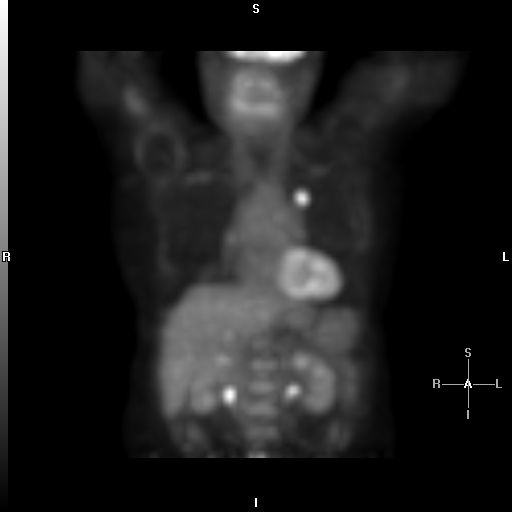 Would you call this cancer a stage I (tumor was 2.4 x 1.4 cm) and proceed to surgery? The patient is a 69-year-old African-American woman who came to pulmonary clinic for multiple pulmonary nodules that were picked up in the course of abdominal CT for workup for abdominal pain with increased LFTs (which have since normalized). She has a history of hypertension, diabetes, peripheral vascular disease, and hyperlipidemia. She is a nonsmoker. No fever chills cough SOB, diaphoresis or constitutional symptoms. Exam: A pleasant woman in no acute distress. WT of 197, BP 185/83, P is 65, R 18, O2 sat is 97% on room air. Trachea midline. No lymphadenopathy and no supraclavicular adenopathy. No thyromegaly. 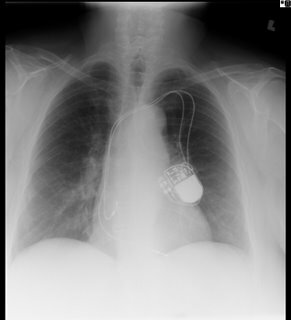 Lungs: Clear to auscultation. No wheezing, rales, or rhonchi. No dullness to percussion. No egophony, symmetric chest wall on inspiration. Heart: Regular rate. S1, S2. Abdomen: Positive bowel sounds. No masses. No liver edge felt. No clubbing, cyanosis, or edema. PFT's: FEV1/FVC 81, FEV1 76% predicted, FVC 73% predicted. These nodules are all non-calcified. The largest is 8 mm. 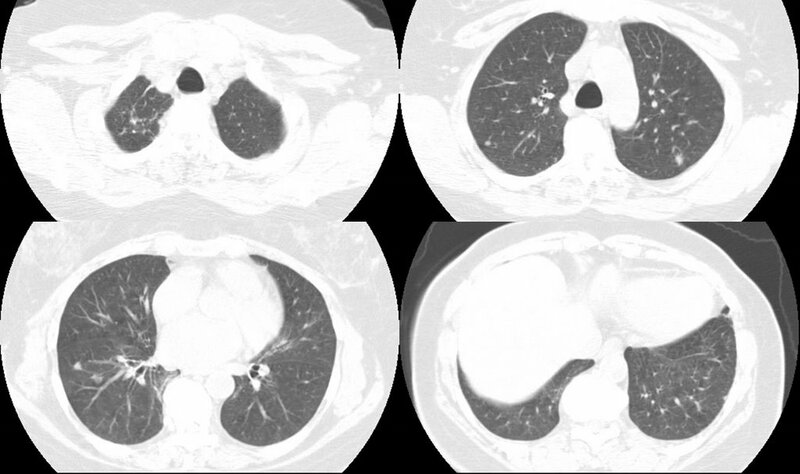 There is interval growth of left lower lobe nodule and right apical nodule compared to a CT 6 months prior. The subcarinal soft tissue is "prominent" but ambiguous whether it's enlarged. On abd CT, the spleen, pancreas, kidney, gallbladder and adrenals are unremarkable. 2 calcified hepatic granulomas are seen. Any thoughts on workup or management? At ATS there was a stand on a rapid IgE testing system on capillary blood and some of us had it done just to check out the system. One of us (with Hx of rhinitis but noasthma) had the results come back at an IgE level of 900 (their upper limit was 136). Would you investigate it any further (CBC with diff, etc.) ? Patient with a right pleural effusion, more than 1500 ml tapped. 2nd tap: more than 1700 ml tapped 6 days later. Contrast CT revealed pelvic fibroids. Effusion results protein, probably assoc. w/ RBC.5 to 11 months prior, sonograms, contrast MRI revealed uterine fibroids 8 to 10 mm in size, stable in size over 6 months. Uterine scrape (not complete D and C) test benign. No indications of ovarian cysts, etc. Hysterectomy not chosen due to stable fibroid size and results of uterine scrape.Heavy coughing for 9 mos. Chronic post-nasal drip for 23 mos. Allergy tests reveal slight allergy to a few local plants. Chest xray showed: Pleural effusion right side. 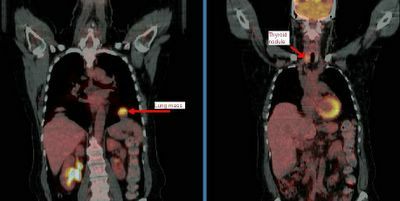 Latest contrast CT pelvic fibroid.Previous ultrasound and contract MRI showed uterine fibroids stable after approx 6 mos. Effusion samples from 2 taps have no cytology assoc. 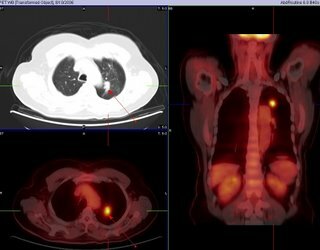 w/cancer, no pancreatitis, tb/fungus results not yet available. Unremarkable except for protein. Any suggestions on this reaccumulating effusion? 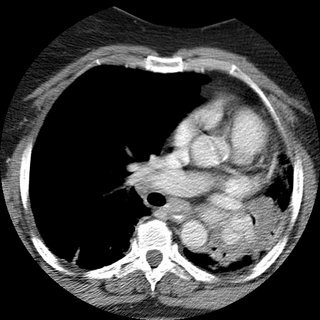 Anonymous asks, If a patient, on chest CT, has a mass invading the hilum and mediastinum and there is also a pleural effusion, would you be able to simply do a thoracentesis for cytology and forego the bronch? 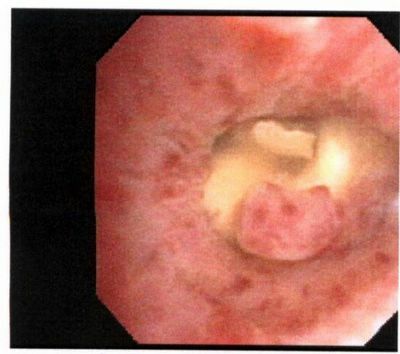 My take is that a bronchoscopy would not be neccessary, as a positive effusion will both diagnose and stage it as a T4. What do you think? 35 year old without PMhx except a MVA 5 years ago, anxiety and depression. Now with chills and subjective fever and weight loss for the past few months. Meds: Paxil. Fhx: brother died of liver failure, patient does not know etiology. SH denies IVDA. 2 PPD x 20 years. Quit 5 yrs ago. HIV negative. Exam Afebrile. VSS. Some decr breath sounds upper lung zones b/l. WBC 11. So, I saw a patient last week for Alpha-1 AT deficiency. 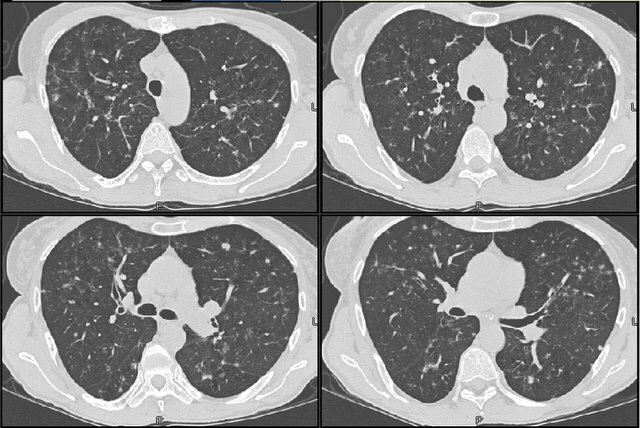 Phenotypically, she has the disease--lower lobe emphysema, severe obstructive disease (FEV1 of 1.0 L which improved to 1.35 while on augmentation therapy with Prolastin). She has a family history of the disease and is a non-smoker (with substantial second-hand exposure). Her measured enzyme level, prior to the start of weekly Prolastin, was 31 mg/dl (lab range for normal is 100-190 mg/dl). So, the interesting thing is that she (and her family members with the disease) has an M-Z genotype, which should be a "normal" phenotype without disease. The genotype was confirmed with separate studies, as was her son's genotype. Anyone seen this before? Any comments? 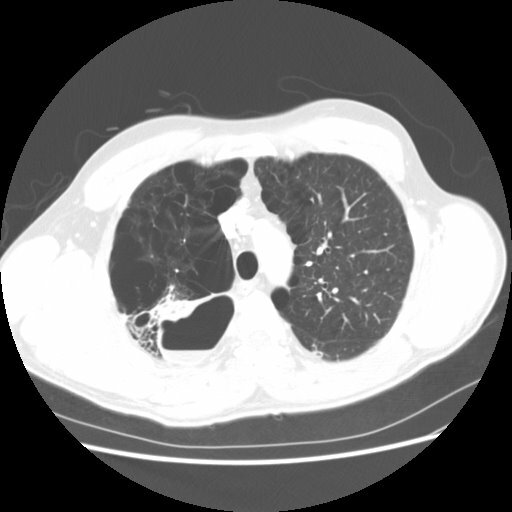 I have just seen a 26 y/o patient in the office for recurrent respiratory tract infections. He has a Hx of prune-belly syndrome (poor abdominal muscle development with severe urinary tract abnormalities) and has been on HD after a failed renal Txp. 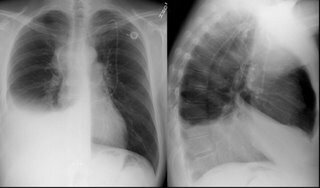 These patients tend to have a restrictive physiology because of the oligohydramnios and sometimes even have hypoplastic lung. Indeed his TLC is ~66%. 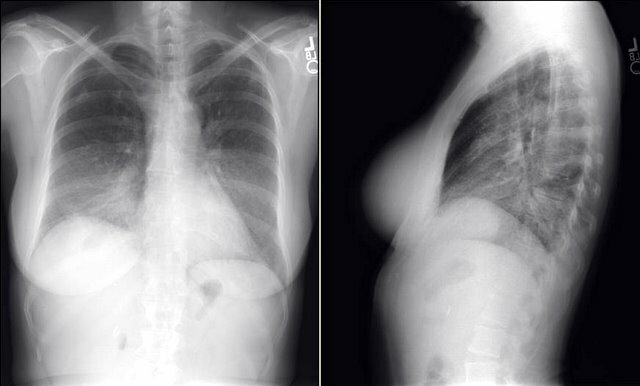 His Cxr is pretty unremarkable but he also has an associated obstructive defect: FEV1 is ~36% witha ratio of<70%. Has anybody seen this condition (or similar ones) be associated with asthma/reactive airways disease? What do you think of this CPET data? 61 y/o obese woman (BMI: 37.3), S/P remote CABG with patent grafts and normal LVEF on recent angiography with persistent DOE. 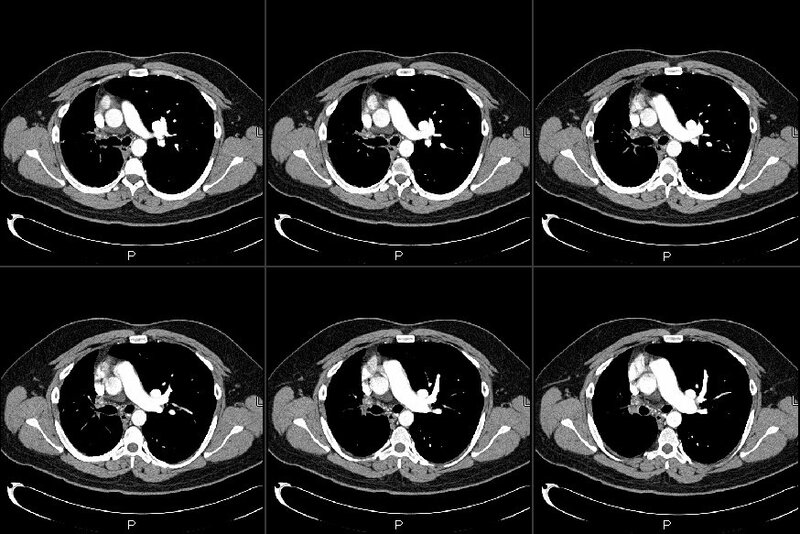 Very remote smoking Hx with only a mild restrictive defect (FVC~70% with FEV1/FVC>80), normal DLCO and normal HRCT. Negative methacholine challenge. FVC at peak declined by 19% and FEV1 at peak did not change. Do you look at the iron/iron sat or do you trust the ferritin? This is a 44 year old man with DM, s/p renal transplant several years ago. He has the other associated micro- and macro- vascular problems associated with DM, including severe PVOD and a non-healing, chronic LE cellulitis for which a BKA has been recommended (but refused--he is on chronic supressive antibiotics). His immunosupression includes cyclosporine and prednisone. 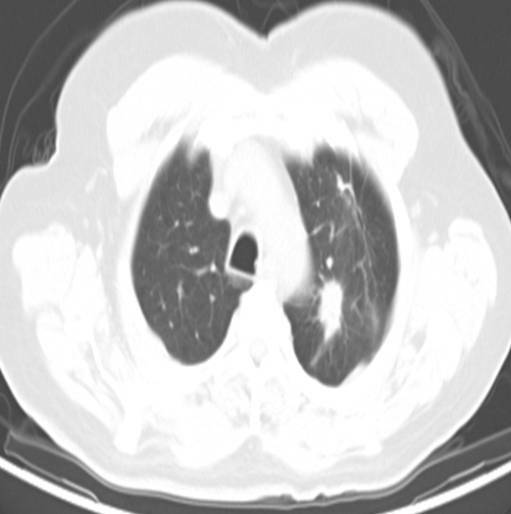 He was admitted to the ICU with hypoxemic respiratory failure requiring intubation for what turned out to be herpes pneumonitis, and was treated with a 21 day course of acyclovir. Over this course, he was easily ventilated and oxygenated with progressively improving respiratory parameters. On two occasions, his weaning parameters were excellent, and he easily tolerated minimal ventilatory support (PS-5/PEEP 5) for 2 hours. 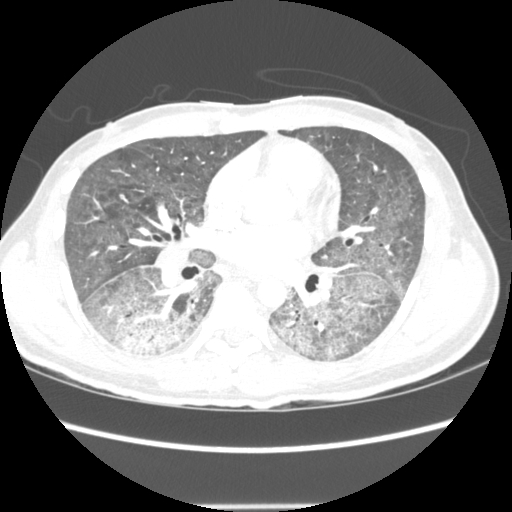 Each time, he required re-intubation for respiratory distress several hours after extubation. Here's some representative cuts from a CT scan done about 10 days into his hospital course. I saw this patient in follow-up today. 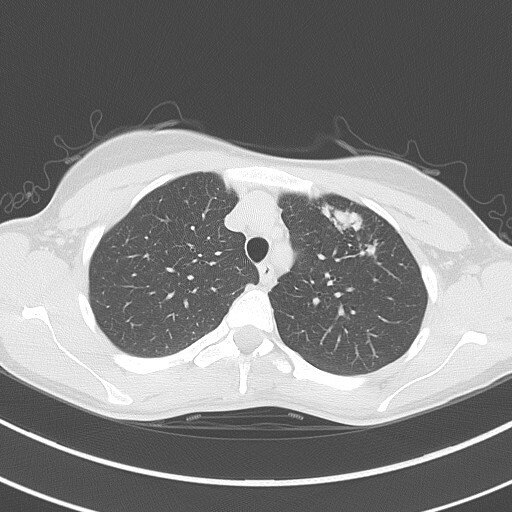 This is an 82 y/o woman with no smoking history but decades of second-hand smoke (her husband died of lung dz). She had a dry cough and a CT scan was done. 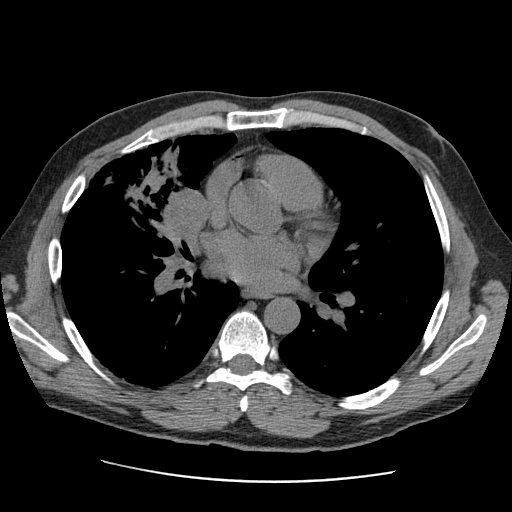 She has the large LUL mass seen on the CT cut (on an outside CT with contrast, the mass seems to invade the PA). I did a bronch and the mass is a non-small cell Ca. Unfortunately, the hilar TBNA were non-diagnostic. 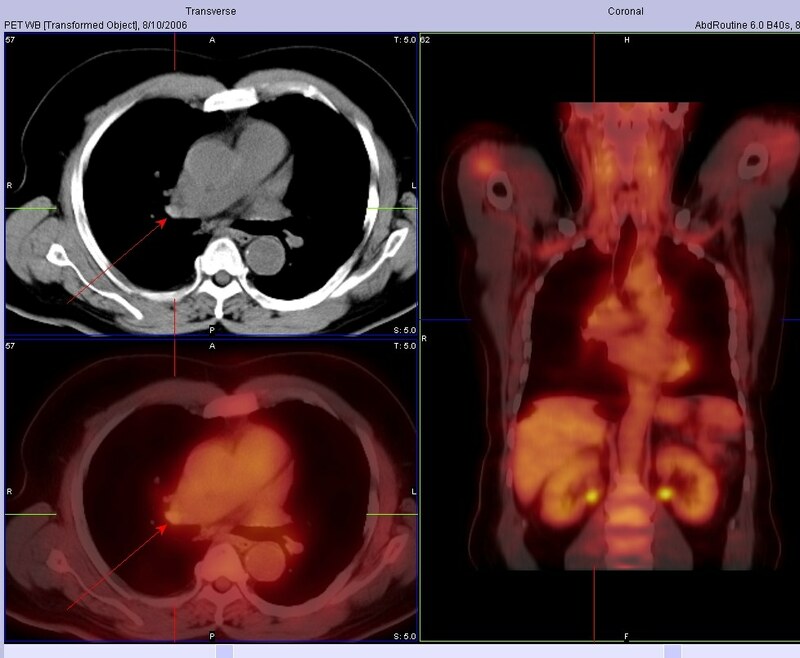 Her PET scan shows marked uptake by the mas, ipsi- and contralateral hilar nodes and pre-tracheal nodes. With the PA involvement (on CT) and the PET results would you be satisfied in calling it a IIIB or would you do a mediastinoscopy to confirm either/both with tissue?